It is worth noting that the TriDef 3D Ignition now has new profiles for the following games: Mass Effect 2, BioShock 2, Assasin's Creed II, ShellShock 2, Street Fighter IV, The Saboteur, The Lord of the Rings Online, Mines of Moria, Perimeter 2 New Earth, Need for Speed Undercover, Leisure Suit Larry - Box Office Bust, Dark Void and Aion. There are now also beta profiles for Divinity II - Ego Draconis, Mini Ninja, Pro Evolution Soccer 2010 and Starcraft II and some updates were done to several game profiles including Google Earth, Left for Dead 2 and Age of Empires III. The TriDef 3D Media Player got an improved rendering backend and several user interface enhancements including higher resolution graphics, special font rendering for 3D displays and better tooltips. Select standard displays - Pageflip in Tridef Control Panel. Now can watch yabazam.com 3d HD content with Nvidia 3D Vision. Does only the media player work with 3D Vision? Don't know about the gaming I'm not in to gaming, I'd be curious if their is a conflict between Nvidia and Ignition drivers? 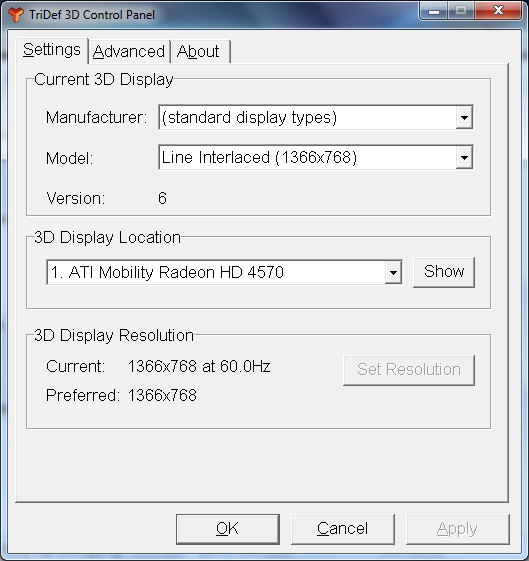 I heard only tridef media player works with 3dvision not gaming.